The Konza Prairie LTER Program is a comprehensive and a multidisciplinary program designed to address long-term research questions relevant to tallgrass prairie ecosystems, and the science of ecology in general. The Konza Prairie Biological Station (KPBS), a 3487-hectare area of native tallgrass prairie in the Flint Hills of northeastern Kansas, is the primary site for most of this research.Since 1981, the broadly based Konza Prairie LTER research program has encompassed studies from the organismic through population, community, ecosystem and landscape ecology levels. These studies are linked via an overarching theme thatincludes the major abiotic and biotic factors influencing this ecosystem. 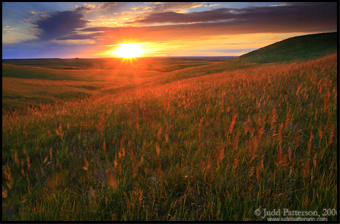 Our central hypothesis is that fire, grazing and climatic variability are essential and interactive factors responsible for the structure and function of tallgrass prairie. In contrast to many other grasslands where ecological processes are constrained by chronic limitations of a single resource (e.g., water),organismic to ecosystem processes and dynamics in tallgrass prairie are products of spatial and temporal variability in multiple limiting resources (water, light, N). Variability in, and switching among, these primary limiting resource(s) are caused by both extant and historical fire, grazing and climatic regimes. Moreover,responses to these factors are strongly dependent on topographic and landscape position. As a result of this complexity, and because grazing and fire regimes are managed in grassland systems worldwide, data from the Konza Prairie LTER program have relevance not only for understanding grasslands, but for broader ecological issues such as stability-diversity questions and interactions among land-use, biodiversity and climate change.